This album should have a global impact, and not just in the Power Metal world, but in the music universe! 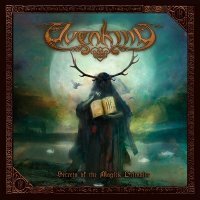 I suspect that my approach to reviewing Elvenking's ninth album, 'Secrets Of The Magick Grimoire', may have elevated my editor's stress levels a little! Upon first listening to this release, I was met with so much depth that I knew I was embarking on a magnificent and complex journey. Out of necessity, I had to revisit this body of work so many times, and on so many days, that I was getting ever closer to my deadline. Since 1997, this Italian super-group have been creating these massive musical masterpieces. Yes, a super-group, and the rarest kind too. They have worked long and hard to achieve this well-deserved status. '...Grimoire' is so massive in content that a proper review could easily fill a whole magazine. From the driving percussion and the raging currents of guitar and violin to the choral-like vocal passages, this album is a complete sonic-cinematic experience. Right from the opener 'Invoking The Woodland Spirit', each movement meshes with the one that follows, smoothly flowing, but at times it's also explosive. Each song is an adventure and each story continues into the next. 'Draugen's Maelstrom', 'The One We Shall Follow' and 'A Grain Of Truth' are all epic in nature. However, there are twelve such epics on this most ambitious opus, and after each listen, you should be utterly exhausted! It's excellently produced, and it has to be, as Elvenking's arrangements simply demand that. The stories they sing about are just as cinematic as the music they painstakingly create. One of my favourite terms, "an ocean of sound", certainly works here. The energy levels do not let up, and the twin guitars of Aydan and Rafahel are not only felt but also amaze. The violin of Lethien matches the intensity of Lancs' working on the shelled skins! Epic storylines and magnificent music are met equally with the vocal exercises of Damna, but of course, all of this has to be held together solidly, and it is, by bassist Jakob! These musical creations begin as a blank canvas before the weaving begins. The songs then intertwine seamlessly with one another, painting a colourful and deeply moving image. Masterful in performance and liquid in sonic currents, this is a completely fluid and united record! 'Secrets Of The Magick Grimoire' should have a global impact, and not just in the Power Metal world, but in the music universe! I am humbled – thank you Elvenking.